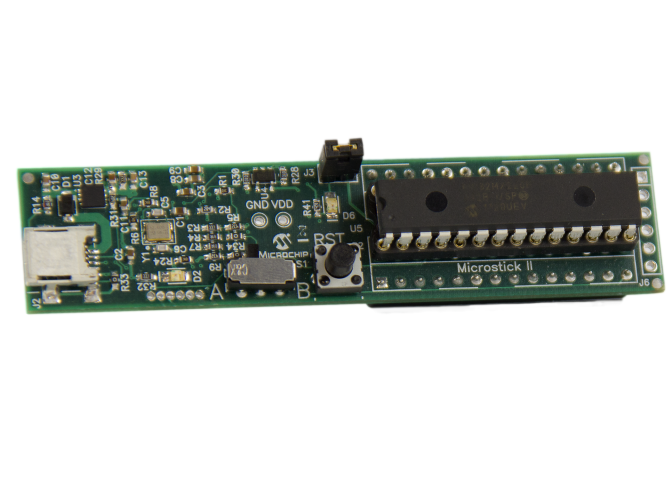 Microstick II delivers a complete low cost development hardware platform for Microchips 16-bit and 32-bit microcontrollers and digital signal controllers. It's the perfect solution to those looking for a low-cost, easy-to-use development platform. The USB-powered kit includes an on-board debugger/programmer, a 28-pin socket for easy device swapping, onboard LED and reset button. It has sockets in the bottom to accept pins so it can be plugged into a 0.6" wide 28-pin socket or a breadboard for development.